Rossi Answers are from Case 1:16-cv-21199-CMA Document 89 Entered on FLSD Docket 12/14/2016. Answer text in bold. Links to case documents have been inserted. It is assumed that earlier copies of Exhibits have not changed. Identified typographical errors have been noted with [sic]. 1. Industrial Heat and its affiliates, including IPH, are involved in developing and investing in “low energy nuclear reaction” (or LENR) technologies that have the potential to provide clean, reliable, efficient, and safe sources of energy. There are various forms of LENR technologies, including Electrolytic Cell Reactors (“ECR”), Gas Metal Matrix Reactors (“GMMR”), and Solid State Hydride Reactors (“SSHR”). Industrial Heat and its affiliates are working on the development of all such technologies, often in conjunction with inventors who initially discovered or developed different forms or applications of these technologies. 1. Plaintiffs lack sufficient knowledge or information to admit or deny the allegations in Paragraph 1 of the Counterclaim and therefore deny the same and demand strict proof thereof. 2. Prior to 2012, Rossi claimed that he had developed an E-Cat device, which when used in connection with an E-Cat fuel/catalyzer formula (“E-Cat Fuel”), could produce well over six times the energy it consumed (which would equate to a coefficient of performance (“COP”) of 6.0). Consistent with its guiding mission to develop and invest in LENR technologies, Industrial Heat entered into the License Agreement with Leonardo and Rossi in October 2012. 2. Plaintiffs admit the allegations contained in Paragraph 2 related to the Plaintiffs’ development of the E-Cat device and E-Cat Fuel and the fact that Industrial Heat entered into the License Agreement with Plaintiffs in October 2012. Plaintiffs lack sufficient knowledge to admit or deny remainder of the allegations contained in Paragraph 2 and therefore deny the same. 3. Under the License Agreement, it was possible for Leonardo to earn three different payments. The first was for the Plant, but was refundable to Industrial Heat or IPH if Leonardo and Rossi could not “validate” during a 24-hour test period that the Plant could produce at least six times the energy it consumed – a COP of 6.0 (“Validation”). License Agreement § 3.2(a). The second payment was for a license and transfer to Industrial Heat or IPH of all of the E-Cat IP, but only if Validation could be achieved. Id. § 3.2(b). The third payment was due if Leonardo and Rossi could demonstrate that the Plant could consistently operate at a COP of at least 4.0, if not at the COP level at which Validation was achieved, for 350 out of 400 days (“Guaranteed Performance”). Id. § 3.2(c). 3. Plaintiffs state that the License Agreement and amendments thereto speak for themselves. Plaintiffs deny the allegations contained in Paragraph 3 to the extent that they are inconsistent with the terms of the License Agreement. 4. Industrial Heat made the first payment under the License Agreement to Leonardo – an amount deemed by the License Agreement to “include payment in full for the Plant” – in October 2012. License Agreement § 3.2(a). That payment was in the amount of $1.5 million. Leonardo and Rossi purported to achieve the 24-hour validation from April 30 to May 1, 2013,(3) claiming a COP in excess of 10.0, after which they purported to transfer all of the E-Cat IP to Industrial Heat and IPH in exchange for the second payment. The second payment under the License Agreement – in the amount of $10 million to Leonardo – was made in June 2013. 4. Plaintiffs admit that Defendant IH made the first payment due under the License Agreement to Leonardo in October 2012 and that the payment was in the amount of $1.5 million. Plaintiff admits that validation was achieved according to the terms of the License Agreement and amendments thereto from April 30 to May 1, 2013 and that upon completion of the validation, payment was received in the amount of $10 million from Defendants. While Plaintiffs admit that a COP in excess of 10 was achieved during the validation test, Plaintiffs deny any inference that the measurement of the COP was made by the Plaintiffs. To the contrary, the COP measurements were made by the agreed upon third party Expert Responsible for Validation (“ERV”) and the measurement of a COP greater than 10 was reported by the ERV. The remainder of the allegations contained in Paragraph 4 are denied to the extent they contradict the express terms of the License Agreement and amendments thereto. The License Agreements and amendments thereto speak for themselves. 5. The long-term “Guaranteed Performance” demonstration under the License Agreement was to take place shortly after the 24-hour Validation. More specifically, Leonardo was required to deliver the Plant to Industrial Heat within 30 days following Validation, and then the Guaranteed Performance demonstration was to take place over the “400 day period commencing on the date immediately following delivery of the Plant” to Industrial Heat. Id. §§ 3.2(a) & 3.2(c). Guaranteed Performance required Leonardo and Rossi to operate the Plant “at the same level (or better) at which Validation was achieved for a period of 350 days (even if not consecutive) over a 400 day period.” Id. § 5. 5. Plaintiffs deny the allegations contained within Paragraph 5 of the Counterclaim to the extent they contradict the terms of the License Agreement and amendments thereto. The License Agreements and amendments thereto speak for themselves. 6. The testing Leonardo and Rossi now claim was the Guaranteed Performance did not commence immediately following the delivery of the Plant to Industrial Heat. In fact, that testing began well over one year after the Guaranteed Performance period commenced under the License Agreement – making it impossible for the Plant to achieve Guaranteed Performance during the time period required by the License Agreement. 6. Plaintiffs admit that the Guaranteed Performance test did “commence immediately following the delivery of the Plant to Industrial Heat, but deny that it was required to. The Plaintiffs deny the remaining allegations contained in Paragraph 6 of the Counterclaim. 7. Beyond the fact that Guaranteed Performance could not be achieved in the required time period, Leonardo and Rossi knew that the Plant could not produce a COP of 10.0 or greater (or even a COP or 4.0 or greater) for 350 out of 400 days. As a result, Leonardo and Rossi manipulated the testing process by, among other things, 1) insisting that the Plant be relocated to Miami, far away from Industrial Heat’s offices, to provide steam to a purported manufacturing “customer” that did not actually exist; 2) manipulating, along with Fabiani, the operation of the Plant and the reports of the Plant’s purported operations, to make it appear that the Plant was producing a COP far greater than 10.0; and 3) enlisting Penon to produce a false report stating that Guaranteed Performance was achieved. 7. Plaintiffs deny the allegations contained in Paragraph 7 of the Counterclaim. 8. Eventually Counter-Plaintiffs discovered that the test that Leonardo and Rossi were conducting, in conjunction with the supposed “customer” in Miami, was not a real test at all, but a carefully scripted effort to deceive Counter-Plaintiffs into 1) providing Leonardo and Rossi with credibility in their efforts to license and promote the E-Cat IP to others and/or obtain investments from others in their business ventures, 2) making the third payment under the License Agreement to Leonardo, 3) paying a multitude of expenses of Leonardo and Rossi including in connection with their operations in Florida, and 4) paying Penon and Fabiani for services not rendered and reimbursing them for unnecessary expenses. 8. Plaintiffs deny the allegations contained in Paragraph 8 of the Counterclaim. 9. Plaintiffs lack sufficient knowledge to admit or deny the allegations contained in Paragraph 9 that Defendants continued to undertake any efforts to replicate the results of the Validation test and therefore deny the same and demand strict proof thereof. Plaintiffs affirmatively state that these allegations directly contradict Defendants sworn statements contained in their WIPO Patent Application number WO 2015/127263 A2 filed on August 27, 2015. The remainder of the allegations contained in Paragraph 9 of the Counterclaim are denied. 10. Whether as a result of 1) fabricating the Validation test results so that it appeared that a COP greater than 6.0 was achieved when it was not, 2) not providing Counter-Plaintiffs with all the E-Cat IP, or 3) both, Leonardo and Rossi clearly breached the License Agreement. 10. Plaintiffs deny the allegations contained in Paragraph 10 of the Counterclaim. 11. In addition to the foregoing breach, as well as Leonardo and Rossi’s continuous efforts to deceive Counter-Plaintiffs, Leonardo and Rossi breached the License Agreement by, among other things: 1) improperly disclosing the E-Cat IP to unauthorized third parties, and improperly disclosing the terms of the License Agreement to unauthorized third parties without Counter-Plaintiffs’ written permission, 2) failing to assign certain patents and/or patent applications to IPH, 3) failing to inform Counter-Plaintiffs of the existence of certain patent applications and failing to fully prosecute patent applications related to the E-Cat IP, 4) participating or having a financial interest in companies that would be Counter-Plaintiffs’competitors, and 5) failing to keep the original Leonardo entity (a New Hampshire corporation) active. 11. Plaintiffs deny the allegations contained in Paragraph 11 of the Counterclaim. 12. Counter-Plaintiff Industrial Heat is a Delaware limited liability company having a principal place of business in North Carolina. 12. Plaintiffs admit the allegations contained in Paragraph 12 of the Counterclaim. 13. Counter-Plaintiff IPH is a Netherlands private limited liability company having a principal place of business in the Netherlands. 13. Plaintiffs lacks sufficient knowledge to admit or deny the allegations contained in Paragraph 13 of the Counterclaim therefore deny the same and demand strict proof thereof. 14. Counter-Defendant Rossi has a primary residence in Miami Beach, Florida and, upon information and belief, is a citizen of Italy. 14. Plaintiffs admit the allegations contained in Paragraph 14 of the Counterclaim. 15. Counter-Defendant Leonardo is a Florida corporation having a principal pl14. Plaintiffs admit the allegations contained in Paragraph 14 of the Counterclaim.ace of business in Miami Beach, Florida. 15. Plaintiffs admit the allegations contained in Paragraph 15 of the Counterclaim. 16. Third-Party Defendant JMP is a Florida corporation having a principal place of business in Doral, Florida. 16. Plaintiffs admit the allegations contained in Paragraph 16 of the Counterclaim. 17. Third-Party Defendant Johnson is a citizen of Florida with a primary residence in Boca Raton, Florida. 17. Plaintiffs lacks sufficient knowledge to admit or deny the allegations contained in Paragraph 17 of the Counterclaim therefore deny the same and demand strict proof thereof. 18. Third-Party Defendant Penon is a citizen of Italy with a primary residence in Abano Terme, Italy. 18. Plaintiffs lacks sufficient knowledge to admit or deny the allegations contained in Paragraph 18 of the Counterclaim therefore deny the same and demand strict proof thereof. 19. Third-Party Defendant Fabiani is a citizen of Italy with a primary residence in Miami Beach, Florida. 19. Plaintiffs lacks sufficient knowledge to admit or deny the allegations contained in Paragraph 19 of the Counterclaim therefore deny the same and demand strict proof thereof. 20. Third-Party Defendant USQL is a Florida limited liability company having a principal place of business in Miami Beach, Florida. Fabiani is USQL’s sole member. 20. Plaintiffs lacks sufficient knowledge to admit or deny the allegations contained in Paragraph 20 of the Counterclaim therefore deny the same and demand strict proof thereof. 21. Third-Party Defendant Bass, upon information and belief, is a citizen of Florida with a primary residence in this judicial district. 21. Plaintiffs lacks sufficient knowledge to admit or deny the allegations contained in Paragraph 21 of the Counterclaim therefore deny the same and demand strict proof thereof. 22. This Court has jurisdiction over this action pursuant to 28 U.S.C. § 1367. The claims pled herein are related to the claims pled in the Complaint and arise out of the same case or controversy. 22. Plaintiffs admit the allegations contained in Paragraph 22 of the Counterclaim. 23. Leonardo is subject to personal jurisdiction in this judicial district because it is a Florida corporation with a principal place of business in Miami Beach, Florida. 23. Plaintiffs admit the allegations contained in Paragraph 23 of the Counterclaim. 24. Rossi is subject to personal jurisdiction in this judicial district because he is a Florida resident with a primary residence in Miami Beach, Florida. 24. Plaintiffs admit the allegations contained in Paragraph 24 of the Counterclaim. 25. JMP is subject to personal jurisdiction in this judicial district because it is a Florida corporation with its principal place of business in Doral, Florida. 25. Plaintiffs lack sufficient knowledge to admit or deny the allegations contained in Paragraph 25 of the Counterclaim therefore deny the same and demand strict proof thereof. 26. Johnson is subject to personal jurisdiction in this judicial district because he is a Florida resident with a primary residence in Boca Raton, Florida. 26. Plaintiffs lack sufficient knowledge to admit or deny the allegations contained in Paragraph 26 of the Counterclaim therefore deny the same and demand strict proof thereof. 27. Penon is subject to personal jurisdiction in this judicial district because he engaged in business in this judicial district from which the claim against him arises and committed tortious acts in this judicial district that are the basis of the claim against him. 27. Plaintiffs lack sufficient knowledge to admit or deny the allegations contained in Paragraph 27 of the Counterclaim therefore deny the same and demand strict proof thereof. 28. USQL is subject to personal jurisdiction in this judicial district because it is a Florida limited liability company with its principal place of business in Miami Beach, Florida. 28. Plaintiffs lack sufficient knowledge to admit or deny the allegations contained in Paragraph 28 of the Counterclaim therefore deny the same and demand strict proof thereof. 29. Fabiani is subject to personal jurisdiction in this judicial district because he is a Florida resident with a primary residence in Miami Beach, Florida. 29. Plaintiffs lack sufficient knowledge to admit or deny the allegations contained in Paragraph 29 of the Counterclaim therefore deny the same and demand strict proof thereof. 30. Bass is subject to personal jurisdiction in this judicial district because, upon information and belief, he is a Florida resident with a primary residence in this judicial district. 30. Plaintiffs lack sufficient knowledge to admit or deny the allegations contained in Paragraph 30 of the Counterclaim therefore deny the same and demand strict proof thereof. 31. Venue is proper in this judicial district pursuant to 28 U.S.C. §§ 1391(b)(1) & (c)(3) because Leonardo, Rossi, and Third-Party Defendants other than Penon reside in this district, and Penon does not reside in the United States. Venue is also proper in this judicial district pursuant to 28 U.S.C. § 1391(b)(2) because a substantial part of the events or omissions giving rise to the claims asserted herein occurred in this judicial district. 31. Plaintiffs admits that the venue is proper in this judicial district as to the allegations against the Plaintiffs. The Plaintiffs lack sufficient knowledge to admit or deny the allegations contained in Paragraph 31 of the Counterclaim therefore deny the same and demand strict proof thereof. Thomas Darden’s initial meeting with Rossi. 32. Industrial Heat was formed in October 2012 to support and invest in LENR technologies. If proven reliable and controllable, LENR technologies have the potential to provide an energy resource that does not generate radioactive waste or emit other harmful pollutants. Since its inception, Industrial Heat has worked to identify and partner with promising LENR inventors with an eye towards commercializing products that displace traditional fuel sources in generating both heat and electricity without emitting radioactive waste. 32. Plaintiffs lack sufficient knowledge to admit or deny the allegations contained in Paragraph 32 of the Counterclaim therefore deny the same and demand strict proof thereof. 33. In June 2012, representatives from AEG introduced Darden to Rossi at Rossi’s apartment in Miami Beach, Florida. In making the introduction, AEG explained that Rossi was an inventor working on certain LENR technology. At the time of the meeting, AEG held an exclusive right to commercially market Leonardo and Rossi’s E-Cat technologies in the Americas. 33. Plaintiffs admit the allegations contained in Paragraph 33 of the Counterclaim. 34. During the June 2012 meeting, Rossi told Darden that he had developed and was continuing to develop a device (the E-Cat) that could produce energy at remarkably high levels without generating the harmful byproducts normally associated with nuclear reactions. 35. Thereafter, discussions continued among Rossi, Darden, and others regarding opportunities to develop and commercialize the E-Cat technology. 35. Plaintiffs admit the allegations contained in Paragraph 35 of the Counterclaim. The License Agreement between Industrial Heat, Leonardo, Rossi, and AEG. (footnote) 4. Missing from the copy of the License Agreement attached to the Complaint as Exhibit B are 1) Exhibit B to the License Agreement (Rossi and Leonardo’s license agreement with AEG) and 2) the first page of Exhibit C to the License Agreement. 36. Plaintiffs admit that they entered into the License Agreement with AEG and IH. Plaintiffs lack sufficient knowledge to admit or deny that the License Agreement attached as Exhibit “B” to the Complaint is incomplete therefore deny the same and demand strict proof thereof. those obligations are described further below. 37. Plaintiffs state that the License Agreement and amendments thereto speak for themselves. Plaintiffs deny the allegations contained in Paragraph 37 to the extent that they are inconsistent with the terms of the License Agreement. Retention by Leonardo of the $1,500,000 component of the purchase price and payment of the $10,000,000 described in Section 3.2(b) above are subject to successful Validation of the Plant. . . . The Validation will be made in the factory of Leonardo in Ferrara, Italy on April 30th and May 1, 2013 (unless otherwise agreed in writing by [Industrial Heat or IPH] and Leonardo). Validation will be deemed successful and achieved when the expert responsible for validation (“ERV”) certifies that the performance standards for the Plant set forth in Exhibit A to [the First Amendment] have been met. To make this measurement the ERV will measure the flow of the heated fluid and the Delta T between the temperature of the fluid before and after the E-CAT reaction.” License Agreement § 4. 38. Plaintiffs state that the License Agreement and amendments thereto speak for themselves. Plaintiffs deny the allegations contained in Paragraph 38 to the extent that they are inconsistent with the terms of the License Agreement. 39. Second, the License Agreement imposes confidentiality obligations on Leonardo and Rossi with respect to the terms of the License Agreement. The License Agreement states: “While this Agreement is in effect and after this Agreement terminates, each party hereto and its Affiliates shall keep confidential, and shall not disclose, the terms of this Agreement to any other Person without the prior consent of each other Party hereto,” with certain exceptions. Id. § 16.4. 39. Plaintiffs state that the License Agreement and amendments thereto speak for themselves. Plaintiffs deny the allegations contained in Paragraph 39 to the extent that they are inconsistent with the terms of the License Agreement. 40. Third, the License Agreement imposes confidentiality obligations on Leonardo and Rossi with respect to the E-Cat IP. The License Agreement states that “[d]uring the term of this Agreement, each of Leonardo, Rossi, and AEG agrees to keep the E-Cat IP strictly confidential and not disclose any of the E-Cat IP to any other party,” also with certain exceptions. Id. The License Agreement imposes no such confidentiality obligation on Counter-Plaintiffs. In fact, Counter-Plaintiffs are allowed to disclose the E-Cat IP to anyone they want. 40. Plaintiffs state that the License Agreement and amendments thereto speak for themselves. Plaintiffs deny the allegations contained in Paragraph 40 to the extent that they are inconsistent with the terms of the License Agreement. 41. Fourth, the License Agreement imposes very specific obligations upon Leonardo with respect to patent prosecution and maintenance. In particular, the License Agreement requires that Leonardo, with respect to all Licensed Patents (as defined in the License Agreement): 1) prepare, file, and prosecute patent applications relating to the Licensed Patents; 2) maintain the Licensed Patents; 3) pay all fees and expenses associated with the just mentioned first two requirements; 4) keep Counter-Plaintiffs informed of the filing and progress of the prosecution of Licensed Patents and related patent applications; 5) consult with Counter- Plaintiffs concerning decisions that could affect the scope or enforcement of any issued claims or the potential abandonment of patent applications or patents relating to the Licensed Patents; and 6) notify Counter-Plaintiffs in writing of any additions, deletions, or changes in status of the Licensed Patents or patent applications related to the Licensed Patents. See id. § 7.1. The License Agreement also imposes limitations on Leonardo’s ability to abandon any patent application or patent that is a Licensed Patent. See id. § 7.2. 41. Plaintiffs state that the License Agreement and amendments thereto speak for themselves. Plaintiffs deny the allegations contained in Paragraph 41 to the extent that they are inconsistent with the terms of the License Agreement. 42. Fifth, the License Agreement contains a “Covenant Not to Compete” provision that prohibits Leonardo, Rossi, or any of their affiliates from directly or indirectly owning, managing, operating, joining, or having a financial interest in any other business or enterprise “(a) engaged in the design, development, manufacture, distribution, lease, rental or sale of any E-Cat Products, or provision of any services related thereto or (b) which is competitive with the E-Cat Products, unless Leonardo . . . shall have obtained the prior written consent of [Counter- Plaintiffs].” Id. § 13.3. 42. Plaintiffs state that the License Agreement and amendments thereto speak for themselves. Plaintiffs deny the allegations contained in Paragraph 42 to the extent that they are inconsistent with the terms of the License Agreement. 43. Sixth, the License Agreement requires that Leonardo and Rossi “file all necessary documentation and returns with respect to any applicable sales, use, transfer, real property transfer, recording, gains, stock transfer and other similar taxes and fees pertaining to the respective revenues derived by the Parties in respect of the E-Cat IP (such as taxes and fees), including any interest or penalties thereon.” Id. § 13.5. The License Agreement also requires Leonardo and Rossi to keep the E-Cat IP “free and clear of any Liens.” Id. §§ 12(a) & 12(e). 43. Plaintiffs state that the License Agreement and amendments thereto speak for themselves. Plaintiffs deny the allegations contained in Paragraph 43 to the extent that they are inconsistent with the terms of the License Agreement. 44. Finally, the License Agreement, as amended by the First Amendment, prohibits Leonardo and Rossi from “assign[ing] or otherwise transfer[ring] any of [their] rights . . . under this Agreement, in each case whether voluntarily, involuntarily, by operation of law or otherwise, without [Counter-Plaintiffs’] prior written consent.” Id. § 16.7; First Amendment § 1.C. 44. Plaintiffs state that the License Agreement and amendments thereto speak for themselves. Plaintiffs deny the allegations contained in Paragraph 44 to the extent that they are inconsistent with the terms of the License Agreement. 45. As explained more fully herein, Leonardo and/or Rossi violated each of the aforementioned provisions of the License Agreement. 45. Plaintiffs deny the allegations contained in Paragraph 45 of the Counterclaim. 46. Furthermore, Leonardo and Rossi made certain representations and warranties in the License Agreement. For example, Leonardo and Rossi, “jointly and severally,” represented that “[Leonardo was] duly organized, validly existing and in good standing as a corporation or other entity as represented herein under the laws and regulation of its jurisdiction of incorporation or organization” and that “it [had], and throughout the term of the License [would] retain, the full right, power and authority to enter into this Agreement and to perform its obligations.” License Agreement §§ 11(a) & 11(b). Furthermore, Leonardo and Rossi, jointly and severally, each represented that they “[had] and throughout the Term [would] retain the full, unconditional and irrevocable right, power and authority to License the E-Cat IP.” Id. § 12(a). Leonardo and Rossi also represented that “each had filed all necessary tax returns” and “ha[d] paid all taxes.” Id. § 12(j). The First Amendment to the License Agreement and assignment of Industrial Heat’s rights to IPH. 47. On or about April 29, 2013, Leonardo, Rossi, AEG, and Industrial Heat executed the First Amendment, which is attached to the Complaint as Exhibit C.
47. Plaintiffs admit the allegations contained in Paragraph 47 of the Counterclaim. 2014. The Amended Assignment and Assumption is attached hereto as Exhibit 27. 49. At or about the time of the Validation testing, Industrial Heat tendered a payment of $10 million to a designated escrow agent. Pursuant to the License Agreement, the $10 million was not paid directly to Leonardo and Rossi because Leonardo and Rossi were required not only to conduct the Validation testing, but also to provide all E-Cat IP to Industrial Heat in order to be entitled to the $10 million. 49. Plaintiffs admit that at or about the time of the Validation testing, a payment was tendered to the escrow agent. Plaintiffs lack sufficient knowledge to admit or deny that such payment was made by Industrial Heat therefore deny the same and demand strict proof thereof. As to the remaining allegations contained in Paragraph 49, Plaintiffs state that the License Agreement and amendments thereto speak for themselves. Accordingly, Plaintiffs deny the remaining allegations contained in Paragraph 49 to the extent that they are inconsistent with the terms of the License Agreement. Testing the Plant in Italy, North Carolina, and Florida. 50. Because Leonardo and Rossi knew that the Plant could not achieve Validation as defined in the License Agreement, they manipulated the Validation testing procedure to deceive Counter-Plaintiffs into making the second payment under the License Agreement. 50. Plaintiffs deny the allegations contained in Paragraph 50 of the Counterclaim and demand strict proof thereof. This morning I had a meeting with the Health Office of the Province of Ferrara, which has to authorize the 24 hours test (it is unthinkable to make it without authorization, we could be stopped by the police upon a phone call due to the noise of the air escape of the condensers, because we must dissipate the energy not having any possible utilization for it). We found an acceptable solution. He explained to me that the Italian law “DPR ( Decreto del Presidente della Repubblica) # 551- Dec. 21 1999 requests an authorization for any plant that makes more than 35 kWh/h and this authorization takes at least 6 months. But we are advantaged, because LENR do not exist in the known technology, therefore when we say 35 kWh we say kWh consumed, because plants that produce more than the energy they consume “do not exist”. Now, 35 x 6 = 210 kW[.] Therefore if we can consume up to 35 kWh/h without authorization, this implies that in out LENR case I can produce up to 210 kWh/h, which is a consistent amount of energy. I will steal something ( maybe the COP will be more) . . . .
51. Plaintiffs admit that the Validation test was originally supposed to be performed on the Plant over the course of 24 hours. Plaintiffs deny that any actions were taken to manipulate the Validation test as alleged in Paragraph 51 of the Counterclaim and demand strict proof thereof. Plaintiff admits that he sent the e-mail attached as Exhibit 9 to the Counterclaim, and the e-mail speaks for itself. 52. Upon information and belief, Rossi had no such meeting with the Ferrara Health Office, and Rossi’s statement was false that Italian law would not allow for the 24-hour Validation process as set forth in the License Agreement without first obtaining a permit that would require “at least 6 months” to obtain. 52. Plaintiffs deny the allegations contained in Paragraph 52 of the Counterclaim and demand strict proof thereof. 53. Unaware that Rossi had misrepresented his meeting with the Ferrara Health Office and Italian law, Industrial Heat agreed to amend the License Agreement so that Validation would require testing of only 30 reactors instead of the entire Plant. 53. Plaintiffs deny the allegations contained in Paragraph 53 of the Counterclaim and demand strict proof thereof. Unit A will be required to consistently produce energy that is at least six times greater than the energy it consumes (that is, a coefficient of performance ‘COP’ of six or greater) and steam that is consistently 100 degrees Celsius or greater during the 24 hour test period. Id. The Validation Protocol also states that Unit A would be tested from 9:00 a.m. on April 30, 2013 through 9:00 a.m. an May 1, 2013. Id. 54. Plaintiffs state that the License Agreement and amendments thereto speak for themselves. Plaintiffs deny the allegations contained in Paragraph 54 to the extent that they are inconsistent with the terms of the License Agreement or amendments thereto and demand strict proof thereof. 55. Later in April 2013, Rossi confirmed that the Validation test could be performed with 30 E-Cat reactors. But just before the Validation test was commenced, Rossi claimed that even testing 30 E-Cat reactors was undoable due to restraints under Italian law, and explained that the test needed to be conducted with only 18 E-Cat reactors. This claim by Rossi was false. 55. Plaintiffs deny the allegations contained in Paragraph 55 of the Counterclaim and demand strict proof thereof. 56. Rossi further manipulated the Validation process by ensuring that his friend and colleague, Penon, served as the ERV for the Validation testing. Industrial Heat requested that “one of the big testing companies” work alongside Penon in the measurement and validation of the test. Rossi vehemently objected, insisting that having one of the big testing companies involved would “create big problems” for him. 56. Plaintiffs deny the allegations contained in Paragraph 56 of the Counterclaim and demand strict proof thereof. 57. The Validation testing occurred from April 30 through May 1, 2013. The testing lasted for slightly less than the 24-hour period required by the Validation Protocol and included only 18 E-Cat reactors. On or about May 7, 2013, Penon issued his Evaluation Test Report on the Validation test (the “Evaluation Report”). According to the Evaluation Report, the 18 individual E-Cat reactors tested over the course of the 23 1/2 hour period produced a COP of 10.85. 57. Plaintiffs admit that the Validation testing occurred from April 30 through May 1, 2013 of 18 reactors as agreed upon by the parties prior to the commencement of the Validation test. Plaintiffs state that all of the testing protocol were followed and/or waived by Defendants. Plaintiffs admit that the ERV reported that the E-Cats produced a COP of 10.85. Plaintiff lacks sufficient facts to admit or deny the remaining allegations contained in Paragraph 57 pertaining to longevity of the Validation test as the test was over three years ago and the Counterclaim represents the first time anyone has alleged an unapproved variation from the test protocol. (footnote) 5. The E-Cat reactors addressed in the Ferrara Report were different in design from the E-Cat reactors in the Plant. (footnote) 6. Since its publication, the Ferrara Report has been subject to criticism, but none of those criticisms was available at the time Rossi provided the report to the Industrial Heat representatives. 58. Plaintiffs admit that they provided Defendants a copy of the Ferrara Report, but lack sufficient knowledge to admit or deny the allegations contained in Paragraph 58 relating to when that report was provided to Defendants. Plaintiffs state that the document referenced as the Ferrara Report speaks for itself. Accordingly, Plaintiffs deny the allegations contained in Paragraph 58 inconsistent with the Ferrara Report. Plaintiffs lack sufficient knowledge to admit or deny the allegations alleged in footnote 6 to Paragraph 58 and therefore deny the same and demand strict proof thereof. 59. On or about April 30, 2013, coinciding with the Validation testing and consistent with the License Agreement’s requirements, Industrial Heat tendered a payment of $10 million to a designated escrow agent. Pursuant to the License Agreement, the payment of the $10 million was not made directly to Leonardo because, following any Validation testing, Leonardo and Rossi were also required to provide all E-Cat IP to Counter-Plaintiffs in order to be entitled to the $10 million payment. 59. Plaintiffs admit that on or about April 30, 2013 payment was tendered to the designated escrow agent payment in the amount of $10 million. Plaintiffs lack sufficient knowledge to admit or deny the allegations in Paragraph 59 of the Counterclaim as to which entity made such payment. As to the remaining allegations contained in Paragraph 59, Plaintiffs state that the License Agreement speaks for itself. Plaintiffs deny the remaining allegations to the extent they are inconsistent with the terms of the License Agreement. Rossi and Industrial Heat’s inability to replicate Validation results in North Carolina. 60. Following the Validation testing, a process was undertaken for Leonardo and Rossi to assemble for transfer to Counter-Plaintiffs all E-Cat IP. On June 9, 2013, the escrow agent released the $10 million to Leonardo. In exchange, Leonardo and Rossi purportedly transferred all E-Cat IP to Counter-Plaintiffs. In fact, on the same day that the $10 million payment was released (June 9, 2013), Rossi met with Darden to provide him personally with the last piece of the E-Cat IP to be transferred – the formula for the E-Cat Fuel required to enable an E-Cat reactor to produce the high COP claimed by Leonardo and Rossi. 60. Plaintiffs admit the allegations contained in Paragraph 60 of the Counterclaim as to the process by which the E-Cat IP was transferred to Defendants. To the extent Defendants infer that Plaintiffs (1) did not transfer al [sic] E-Cat IP to Defendants and (2) made any representation on June 9, 2013 relating to the COP attainable with the formula for the E-Cat fuel, such allegations are denied and strict proof is demanded thereof. 61. Leonardo caused the Plant to be delivered to Industrial Heat’s facility in North Carolina in August 2013. This was later than the time required by the License Agreement, as amended by the First Amendment. See License Agreement § 3.2(a); First Amendment § 1.A. 61. Plaintiffs admit that the Plant was delivered by Plaintiffs to IH’s facility in North Carolina in or around August 2013. Plaintiffs deny the remaining allegations contained in Paragraph 61 and state that the parties agreed to the delayed delivery in order for the E-Cat Plant to be certified by a European certifying agency. Industrial Heat specifically waived the requirement that the Plant be delivered to IH within 30 days of the Validation test. 62. Shortly after delivery, Industrial Heat hired several independent contractors to assist Rossi in connection with the development, modification, and testing of the Plant, of various E-Cat reactors, and of a prototype Six Cylinder Unit. 62. Plaintiffs lack sufficient knowledge to admit or deny the allegations contained in Paragraph 62 of the Counterclaim therefore deny the same and demand strict proof thereof. promptly disclose to Industrial Heat any and all improvements, inventions, developments, discoveries, innovations, systems, techniques, processes, formulas, programs and other things that may be of assistance to Industrial Heat or its affiliates, whether patentable or unpatentable, that (i) relate to the actual or demonstrably anticipated research or development by Industrial Heat or any of its affiliates, or (ii) result from any work performed by USQL for or at the request of Industrial Heat, or (iii) are developed on Industrial Heat’s time or using the equipment, supplies or facilities or any Confidential Information or trade secret information of Industrial Heat, or any of its affiliates; and that are made or conceived by USQL . . . while engaged by Industrial Heat. 63. Plaintiffs lack sufficient knowledge to admit or deny the allegations contained in Paragraph 63 of the Counterclaim therefore deny the same and demand strict proof thereof. 64. Leonardo and Rossi were fully aware that, per the clear and express terms of the License Agreement, they were required to commence any “Guaranteed Performance” in 2013. Nevertheless, Leonardo and Rossi made no efforts to commence such a test during 2013. Instead, from approximately September 2013 through December 2013, Rossi was on site at Industrial Heat’s facility in North Carolina working with Industrial Heat personnel in efforts both (a) to develop new versions of E-Cat reactors or new devices in which E-Cat reactors would operate and (b) to replicate the results of prior E-Cat testing as either claimed by Leonardo and Rossi or reported by Penon in connection with the Validation testing in Italy. 64. Plaintiffs deny the allegations contained in Paragraph 64 of the Counterclaim. Specifically, the Second Amendment to the License Agreement modified the time period in which the Guaranteed Performance test was to begin. Pursuant to the Second Amendment to the License Agreement, the Guaranteed Performance test was to commence at a mutually agreeable time. Notwithstanding the Second Amendment to the License Agreement, the Guaranteed Performance Test was not commenced sooner because Defendants failed to locate an adequate facility for the Guaranteed Performance test as well as the requisite governmental approvals in North Carolina. Moreover, Defendants waived any requirement that the Guaranteed Performance test be completed within a specific period of time and expressly consented to the Guaranteed Performance test which was conducted between February 2015 and February 2016 in Doral, Florida. Plaintiffs admit that for much of the year in 2013 he worked with Defendants to develop and test new versions of the E-Cat and to further develop the technology. The remaining allegations contained in Paragraph 64 are denied and strict proof is demanded thereof. 65. Despite Rossi’s presence and participation in the testing in North Carolina, the E- Cat testing in North Carolina was never able reliably or credibly to reproduce the COP of 10.85 as reported by Penon (or even reach the lowest COP threshold identified in the License Agreement, which was a COP of 4.0). 65. Plaintiffs lack sufficient knowledge to admit or deny the allegations contained in Paragraph 65 of the Counterclaim therefore deny the same and demand strict proof thereof. 66. At the time, Industrial Heat personnel were uncertain whether the lack of success was due to the failure of the E-Cat IP technology, or to efforts by Rossi to undermine the testing. With this company Hydrofusion we [meaning Leonardo and Rossi] had agreed upon a draft to sell them IP, know how and manufacturing license for Europe but Germany, France and Italy. By our law, if you send a proposal you are engaged to accept if the proposee accepts all the conditions of the proposal. After receiving your last text at the end of August I decided to go ahead with you, therefore I had to get rid of this engagement. The only way out was to invite them to a test, ask them to bring with them their consultant. I made the test abort, maintaining the temperatures below the starting limit. Then I made up some discussions, I said they made a wrong test, they escaped, I am free. We did not have damages of image, because, knowing what was on the road, I had made before their test a disclaimer, saying that the Hot temperature E-Cat was just a prototype, still under test and validation and subject to modification, thing that I am repeating everywhere. Now I am publishing that I am surprised of all this ado for nothing, since I already said that for the Hot Cat we needed more tests before saying it is a product ready for the market. At this point we can organize with Cherokee a world strategy, since all the other licensees are just commercial: for example in Africa we will have just to pay a royalty to the local agent upon our sale price, but they all are very good and they can sell either energy or plants. Nobody has rights upon the IP, know how, manufacturing and so on. See id. (emphases added). On the same day (September 10, 2012) but in a separate, earlier email, Rossi described his efforts at deceiving Hydro Fusion as a “masterpiece”: “I got rid of the European big license I had to sign. I made a masterpiece making them go voluntarily . . . I will explain personally.”(7) See Ex. 13. (footnote) 7. Leonardo and Rossi’s decision to “get rid of” their Hydro Fusion “engagement” was not of significance to Industrial Heat at the time because Industrial Heat was not negotiating for a license that would cover the same geographic territory as Hydro Fusion’s license. 0029-13_exhibit_13 Rossi email about licensing, and above mail is an explanation of this. 66. Plaintiffs state that the E-mails attached to the Counterclaim as Exhibit 12 and Exhibit 13 speaks for itself. Plaintiffs deny any remaining allegation contained in Paragraph 66 of the Counterclaim and demand strict proof thereof. 67. After Rossi left North Carolina, Counter-Plaintiffs’ personnel continued their work on developing new devices in which E-Cat reactors would operate and, using the E-Cat technology Leonardo and Rossi directly provided them, trying to replicate the results of prior E- Cat testing as either claimed by Leonardo and Rossi or reported by Penon. Rossi would visit the North Carolina facility on occasion to provide his input and opinions as to the device designs (and design changes) and the testing methodologies and results. None of the testing replicated (or came close to replicating) the high COP results previously claimed by Leonardo, Rossi, and Penon, or otherwise generated measurable excess energy. 67. Plaintiffs lack sufficient knowledge to admit or deny the allegations contained in Paragraph 67 of the Counterclaim therefore deny the same and demand strict proof thereof. Plaintiffs admit that Rossi would periodically visit the North Carolina facility to assist Defendants’ subject matter expert, Mr. Thomas Barker Dameron, amongst others, with their work on the E-Cat technology. 68. In late 2013 and early 2014, Leonardo and Rossi made arrangements with the team of scientists who had published the Ferrara Report to conduct another test of a single E-Cat reactor (not an entire Plant or an entire Six Cylinder Unit) over a roughly one month time period in February and March 2014 in Lugano, Switzerland. At the conclusion of the experiment, the scientists concluded in their report (the “Lugano Report”) that the E-Cat reactor produced a COP of 3.2 and 3.6 across two different “runs” of the reactor (which is still less than the lowest COP number reflected in the License Agreement). See Ex. 14. This conclusion was subsequently criticized in a series of publications identifying flaws in the methodology the scientists employed which led to overstatement of their COP calculations. These publications, however, did not surface until 2015. 68. Plaintiffs admit that the Swedish Royal Academy of Sciences performed tests on a single E-Cat reactor constructed by Defendants at their North Carolina facility and that such scientists concluded that the reactor produced a positive COP. Plaintiffs further state that the “Lugano Report” speak [sic] for itself. Plaintiffs deny the remaining allegations contained in Paragraph 68 of the Counterclaim to the extent they are inconsistent with the Lugano Report. Plaintiffs lack sufficient knowledge to admit or deny the allegations contained in Paragraph 68 of the report pertaining to other “publications” and therefore deny the same and demand strict proof thereof. 69. In 2014, knowing that the high COP results that Leonardo, Rossi, and Penon had previously claimed could not be replicated by the various testing of E-Cat reactors in North Carolina (some done with the direct participation of Rossi) or even by the scientists in Lugano (though Rossi had significant control over their testing), Leonardo, Rossi, and others devised a scheme to get the Plant removed from under Industrial Heat’s control in North Carolina and to a location in Florida where Leonardo, Rossi, and others could operate the Plant without careful oversight and could control how any measurements of the Plant’s performance were conducted. 69. Plaintiffs deny the allegations contained in Paragraph 69 of the Counterclaim and demand strict proof thereof. 70. To that end, Leonardo and Rossi enlisted their attorney, Johnson, to create a company that would pose as a “customer” in the Miami area that needed and would pay for steam produced by the Plant. Johnson registered the company, JMP, as a Florida corporation in June 2014. See Ex. 15. JMP was originally incorporated as J.M. Chemical Products, Inc. in June 2014, but changed its name to J.M. Products, Inc. in September 2014. 70. Plaintiffs deny the allegations contained in Paragraph 70 of the Counterclaim as to any role allegedly played by Rossi and/or Leonardo. Plaintiff lacks sufficient knowledge to admit or deny the allegations contained in Paragraph 70 pertaining to the incorporation of J.M. Products, Inc.
7- allow the plant work for 24 hours per day for 360 days per year, while if used as a room heater it could work only 4 months, not per 24 hours per day, with obvious loss of profit. Your proposal to put the plant in a factory owned by yourself at least until recently is dramatically less convincing. Let me do this and I will make a masterpiece ( half masterpiece has already been done finding the Customer as a Chemical Industry and getting the authorization from the Florida State Radiation Control Office). Fulvio is completing the control system, made by 110 computers interconnected. Also that is a masterpiece. See Ex. 16 (emphases added). 71. Plaintiffs admit that Rossi send the July 5, 2014 e-mail attached to the Counterclaim as Exhibit 16. Plaintiffs further state that the July 5, 2014 e-mail speaks for itself. Plaintiffs deny the allegations contained in Paragraph 71 to the extent they are inconsistent with the July 5, 2014 e-mail and demand strict proof thereof. 72. Of note in Leonardo and Rossi’s proposal is that there is no discussion of moving the Plant to Florida to try to achieve “Guaranteed Performance” under the License Agreement. Instead, Leonardo and Rossi enticed Counter-Plaintiffs to allow the Plant to be moved to Florida so that it could be used to provide power to “a real Customer” – a customer in the “Chemical Industry” that had a need for the steam power the Plant could produce “to process their chemical products.” See id. This, Leonardo and Rossi claimed, would provide a real-world demonstration, or test, of the Plant as a viable means of providing power to commercial users. See id. It would also, Leonardo and Rossi claimed, allow for regulatory agencies, to the extent required, to conduct any tests or measurements they needed to authorize the use of future Plants for other commercial purposes (i.e., “allow us to make all the Authorities make all the measurements necessary to get the Authorizations for the next plants”). See id. Leonardo and Rossi further pressured Counter-Plaintiffs to decide on this proposal quickly because this chemical industry customer “must know asap” if it could use the Plant to provide the steam power it needed or if it had to “provide otherwise.” See id. 72. Plaintiffs state that the July 5, 2014 e-mail speaks for itself. Plaintiffs deny the allegations contained in Paragraph 72 to the extent they are inconsistent with the July 5, 2014 email and demand strict proof thereof. 73. Unbeknownst to Counter-Plaintiffs, everything material in the Leonardo and Rossi proposal was false – there was no customer in Florida who needed steam power for its chemical products processing, there was no intention for Leonardo and Rossi to operate the Plant to provide power to a real customer, and there was no intention for Leonardo and Rossi to seek authorizations from regulatory agencies to allow the Plant or subsequent E-Cat plants to be used for other commercial purposes. Instead, the sole intention of Leonardo and Rossi all along was to find a way to get the Plant away from Counter-Plaintiffs and then to conduct a fatally flawed (and fatally late) run at demonstrating “Guaranteed Performance” so that they could falsely claim to be entitled to an additional $89 million payment under the License Agreement. 73. Plaintiffs deny the allegations contained in Paragraph 73 of the Counterclaim and demand strict proof thereof. 74. Also in furtherance of this scheme, Rossi, both in his individual capacity and as the representative of Leonardo, and Johnson, both in his individual capacity and as the representative of JMP, traveled to North Carolina in August 2014 to meet with individuals from Industrial Heat. During this meeting, Rossi and Johnson made a number of false representations to Industrial Heat, most notably that JMP (at the time called J.M. Chemical Products, Inc.) was a confidential subsidiary of Johnson Matthey p.l.c. (“Johnson Matthey”), and that Johnson Matthey was interested in using the E-Cat technology in connection with a confidential manufacturing process it wanted to operate in Florida. In fact, in August 2014 Johnson on behalf of JMP even warranted in writing that JMP “[was] owned by an entity formed in the United Kingdom, and none of Leonardo, Dr. Andrea Rossi, Henry W. Johnson nor any of their respective subsidiaries, directors, officers, agents, employees, affiliates, significant others, or relatives by blood or marriage [had] any ownership interest” in JMP. See Compl. Ex. B. (last page of Plaintiffs’ Exhibit). JMP, however, has never been a subsidiary of Johnson Matthey, was not operating or planning to operate any manufacturing process in Florida, and was in fact owned by persons whom Johnson represented in writing did not have any ownership interest in JMP. 74. Plaintiffs deny the allegations contained in Paragraph 74 of the Counterclaim and demand strict proof thereof. Plaintiff further states that Complaint Exhibit “B” speaks for itself. 75. Not knowing that the representations made by Leonardo, Rossi, JMP, and Johnson about the customer in Florida and the operations to take place in Florida were false, Industrial Heat entered into an agreement with JMP and Leonardo to deliver the Plant to JMP’s “production facility” in Miami, Florida. The agreement was memorialized in a “Term Sheet” executed by Industrial Heat, JMP, and Leonardo on August 13, 2014. The Term Sheet is attached hereto as Exhibit 17. 75. Plaintiffs admit that IH, JMP and Leonardo entered into agreement to deliver the Plant to the facility of JMP and that such agreement was memorialized in a “Term Sheet” on or about August 13, 2014 attached as Counterclaim Exhibit 17. Plaintiffs deny the remaining allegations contained in Paragraph 75 of the Counterclaim. 76. Industrial Heat would not have entered into the Term Sheet agreement had it known that JMP was not a real operating company, that JMP actually had no commercial use for the steam power generated by the Plant, or that JMP was created solely as a ruse to induce Industrial Heat to ship the Plant to Florida. 76. Plaintiffs lack sufficient knowledge to admit or deny the allegations contained in Paragraph 76 of the Counterclaim therefore deny the same and demand strict proof thereof. 77. JMP’s role in the scheme magnified when JMP started sending falsified invoices to Industrial Heat stating the amount of energy or steam JMP was purportedly receiving and using from the Plant during a given month. A selection of the invoices is attached hereto as Exhibit 18. 77. Plaintiffs deny the allegations contained in Paragraph 77 of the Counterclaim and demand strict proof thereof. 78. JMP’s role further intensified when it, along with Leonardo, Rossi, Johnson and Fabiani went so far as to have Bass pose as Director of Engineering for JMP. Leonardo, Rossi, JMP, Johnson and Fabiani enlisted Bass to pretend to be a JMP employee serving as its Director of Engineering to make JMP appear to be a real manufacturing company that would need a Director of Engineering and to create a person with whom they would allegedly interact on technical issues involving JMP’s non-existent operations and operational needs. 78. Plaintiffs deny the allegations contained in Paragraph 78 of the Counterclaim and demand strict proof thereof. 79. They even had Bass meet with Industrial Heat at JMP’s Doral facility and express JMP’s satisfaction with the steam power JMP was receiving from the Plant and using to run its manufacturing operations. 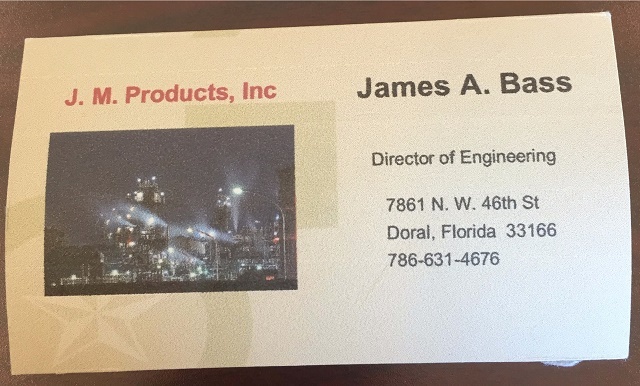 Attached as Exhibit 20 is a copy of the business card provided by Bass representing himself to be JMP’s “Director of Engineering.” Bass also met with others, falsely claiming JMP was using steam from the Plant in a secretive manufacturing process. All the while, JMP, Leonardo, Rossi, Johnson, Fabiani and Bass knew that there was no secretive manufacturing process taking place and JMP had no real use for the steam power. JMP, Leonardo, Rossi, Johnson, Fabiani and Bass’ unconscionable and deceptive practices are further evidence that the testing in Miami was nothing but a sham designed to create the illusions that the Plant performed at levels that could satisfy Guaranteed Performance and that the prior Validation testing was valid. 79. Plaintiffs admit that Mr. James Bass met with IH at JMP’s Doral facility and that a copy of Mr. Bass’ business card is attached to the Counterclaim. Plaintiff denies the remaining allegations contained in Paragraph 79 of the Counterclaim and demands strict proof thereof. 80. Plaintiffs lack sufficient knowledge to admit or deny the allegations contained in Paragraph 80 of the Counterclaim therefore deny the same and demand strict proof thereof. 80. In mid-2015, Industrial Heat hired Joseph Murray (“Murray”) to serve as Vice President of Engineering, and empowered him to assemble a team of engineers and scientists to elevate the level of Industrial Heat’s testing and evaluation of LENR technology. Among other things, one of the projects undertaken by that team was rigorous testing of the E-Cat IP. That testing demonstrated quite clearly that the results previously claimed by Leonardo, Rossi, and Penon simply could not be replicated using the E-Cat IP that Leonardo and Rossi had provided to Counter-Plaintiffs. 81. Notwithstanding that Leonardo and Rossi allowed visitors to the facility in Doral where the Plant was located on a fairly regular basis, in July 2015, Rossi denied Murray access to the Plant without any reasonable justification. See Ex. 19. Had Murray – given his established engineering background – been allowed to access the Plant in July 2015, he would have immediately recognized the deficiencies in the operations that were being conducted by Leonardo and Rossi. 81. Plaintiffs admit that certain visitors were permitted access to the E-Cat Plant in Doral, Florida at the request of Defendants, including several investors, who, on information and belief, made multi-million dollar investments into Industrial Heat based on representations made by Darden and Vaughn as to the efficacy of the E-Cat technology. Plaintiffs further admit that Mr. Joseph Murray was denied access to the plant on one occasion in 2015 because it appeared that Mr. Murray had improper motives, including but not limited [sic][missing “to”] obtaining information to be passed on to a competitor for [sic][of] Leonardo, for wanting to visit the Plant. Plaintiffs deny the remaining allegations contained in Paragraph 81 of the Counterclaim and demand strict proof thereof. 82. Indeed, when Murray eventually gained access to the Plant in February 2016 and examined the Plant, the methodology being used to operate the Plant, and the methodology being used to measure those operations, he immediately recognized that those methodologies were fatally flawed. Some of the flaws that he was quickly able to identify are explained in Exhibit 5. Murray also recognized that the building in which the Plant was located had no method to ventilate the heat that would be produced by the Plant were it producing the amount of steam claimed by Rossi, Leonardo, and Penon such that persons would not have been able to work in the building if the Rossi/Leonardo/Penon claims were true. This conflicted with the claims of individuals who had been in the building when the Plant was operating, all of whom claimed the temperature in the building was near or not much greater than the outside temperature. Photographs of the building ceiling from the inside are attached hereto as Exhibit 26. 82. Plaintiffs lack sufficient knowledge to admit or deny the allegations contained in Paragraph 82 of the Counterclaim therefore deny the same and demand strict proof thereof. 83. Leonardo, Rossi, JMP, Johnson, USQL, Fabiani, and Bass also restricted access to the JMP area at the Doral location, claiming that there was a secretive manufacturing process being conducted there, when in fact it was simply recycling steam from the Plant and sending it back to the Plant as water. 83. Plaintiffs deny the allegations contained in Paragraph 83 of the Counterclaim and demand strict proof thereof. 84. Fabiani, USQL and Penon also played critical roles in the scheme to hide the fact that the Plant does not perform up to the standards set forth in the License Agreement. 85. The USQL Agreement imposes an affirmative obligation upon USQL and Fabiani promptly to disclose information relating to their work on the Plant or the E-Cat IP. See USQL Agreement § 7. The USQL Agreement also makes clear that information obtained by USQL or Fabiani during the course of their work under the USQL Agreement is the sole property of Industrial Heat. Id. § 6. 85. Plaintiffs lack sufficient knowledge to admit or deny the allegations contained in Paragraph 85 of the Counterclaim therefore deny the same and demand strict proof thereof. 86. Despite the fact that Fabiani and USQL are required to “promptly disclose” an array of information related to their work on the Plant or the E-Cat IP, USQL and Fabiani have purposely only been providing very limited information to Industrial Heat. They have not been providing Industrial Heat with accurate, complete information on the Plant, knowing that such information would demonstrate that the Plant was not performing at levels claimed by Leonardo, Rossi and Penon. 86. Plaintiffs lack sufficient knowledge to admit or deny the allegations contained in Paragraph 86 of the Counterclaim therefore deny the same and demand strict proof thereof. 87. Furthermore, Fabiani and USQL have refused and continue to refuse to provide records, “tests and results” and other information relating to their engagement under the USQL Agreement to Industrial Heat, even though they agreed that such information is the property of Industrial Heat. Id. § 6. They have so refused because they are aware that such information demonstrates that the Plant was not performing at levels claims by Leonardo, Rossi and Penon. 87. Plaintiffs lack sufficient knowledge to admit or deny the allegations contained in Paragraph 87 of the Counterclaim therefore deny the same and demand strict proof thereof. Industrial Heat. See, e.g., Ex. 21. 88. Plaintiffs lack sufficient knowledge to admit or deny the allegations contained in Paragraph 88 of the Counterclaim therefore deny the same and demand strict proof thereof. 89. Leonardo, Rossi, JMP, Johnson, USQL and Fabiani are all interconnected in a number of ways. As just one example, Johnson is currently listed as the President of both JMP and Leonardo. He is also the incorporator of USQL and remains its registered agent. 89. Plaintiffs admit that Johnson is listed as the President of Leonardo. Plaintiffs lack sufficient knowledge to admit or deny the remaining allegations contained in Paragraph 89 of the Counterclaim therefore deny the same and demand strict proof thereof. 90. For his part, among other things, Penon primarily contributed to the scheme in a variety of ways relating to the purported measurement of the Plant’s operations in Florida during the purported Guaranteed Performance test. (8) To start, his initial plan and design for measuring the power coming into and out of the Plant was, as he well knew, fundamentally flawed – including using improper equipment to measure the flow of fluid into the Plant and no equipment to measure the flow of heated fluid out of the Plant. Moreover, when the purported Guaranteed Performance test departed from Penon’s plan and design almost immediately after the testing began – including that the number of reactors being operated was far less than the number of reactors specified in Penon’s plan and design – Penon simply disregarded the massive deviation. (footnote) 8. Penon’s participation in the scheme was not limited to this time period. In connection with the Validation test, Penon backed Leonardo and Rossi’s false contention that Italian law only allowed for the test to be conducted using 18 E-Cat reactors. Penon also knowingly did not follow the Validation Protocol. See response to Paragraph 57, supra. 90. Plaintiffs deny the allegations contained in Paragraph 90 of the Counterclaim and demand strict proof thereof. 91. Penon further knowingly relied on flawed or fabricated data collections in his supposed evaluation of the Plant’s performance. For example, Leonardo and Rossi have admitted (on their internet blog postings) that there were days when portions of the Plant were not operating, but Penon in his final report does not report any material decrease in output of the Plant on those days. Rather, he makes the (inexplicable) claim in his final report that on these days the Plant’s performance either did not change or somehow even increased. 91. Plaintiffs deny the allegations contained in Paragraph 91 of the Counterclaim and demand strict proof thereof. 92. In February 2016 at an in-person meeting with Penon, Murray identified a number of flaws in how Penon was conducting his measurements of the Plant. Some of those flaws were also presented in writing to Penon on March 25, 2016. See id. Despite have [sic] full knowledge of the flaws, Penon nevertheless issued his false final report on March 28, 2016, claiming that guaranteed performance was achieved – and that the COPs achieved by the Plant were literally many multiples greater than ever claimed by anyone else (other than Leonardo and Rossi) who had ever tested an E-Cat reactor. Not surprisingly, since the day he left Florida in February 2016, Penon has refused to discuss his measurements, his measurement plan and design, or his report with Counter-Plaintiffs (though he has requested that Counter-Plaintiffs pay him for his work). 92. Plaintiffs deny the allegations contained in Paragraph 92 of the Counterclaim to the extend [sic] they infer that the Guaranteed Performance Test reports were false and/or improper. 93. Counter-Plaintiffs reallege the allegations in Paragraphs 1 through 88 as if fully set forth herein. 93. In response to Paragraph 93, Plaintiffs re-allege its responses to Paragraphs 1-92 as if fully set forth herein. 94. The License Agreement states: “On the date the Escrow Agent pays the $10,000,000 to Leonardo, the License will commence and Leonardo and Rossi will immediately transfer, and the Validation Agent (as defined in Schedule 3.2(b)) will deliver to the Company all E-Cat IP.” License Agreement § 3.2(b). 94. Plaintiffs state that the License Agreement and amendments thereto speak for themselves. Plaintiffs deny the allegations contained in Paragraph 94 to the extent that they are inconsistent with the terms of the License Agreement and demand strict proof thereof. 95. The escrow agent released the $10 million payment to Leonardo and Rossi on June 9, 2013, at which point Leonardo and Rossi became obligated to transfer and deliver to Counter-Plaintiffs all E-Cat IP. 95. Plaintiffs admit the allegations contained in Paragraph 95 of the Counterclaim. 96. Leonardo and Rossi purportedly transferred and delivered all E-Cat IP to Counter- Plaintiffs on June 9, 2013. However, after numerous attempts, both with and without Rossi’s involvement, Counter-Plaintiffs have been unable, using the transferred E-Cat IP, to replicate the results included in the Evaluation Report purportedly certifying that Validation was achieved from April 30 to May 1, 2013, or otherwise generate measureable excess energy. 96. Plaintiffs admit that they transferred and delivered all E-Cat IP to Defendants on or about June 9, 2013. Plaintiffs deny the remaining allegations contained in Paragraph 96 of the Counterclaim and demand strict proof thereof. 97. Only one of three conclusions can be drawn from the foregoing facts: 1) Leonardo and Rossi did not transfer and deliver all E-Cat IP to Counter-Plaintiffs; 2) Validation was never achieved and Penon’s reported COP calculations were false; or 3) both. 97. Plaintiffs deny the allegations contained in Paragraph 97 of the Counterclaim and demand strict proof thereof. 98. Each of these scenarios leads to only one conclusion: Leonardo and Rossi breached the terms of the License Agreement, either by not achieving Validation, not transferring or delivering all of the E-Cat IP to Counter-Plaintiffs, or both. 98. Plaintiffs deny the allegations contained in Paragraph 98 of the Counterclaim and demand strict proof thereof. 99. As a result of Leonardo and Rossi’s breach, Counter-Plaintiffs have suffered and continue to suffer damages including, but not limited to: a) both the $1.5 million and $10 million payments made to Leonardo in connection with the License Agreement; b) other payments made to Leonardo or Rossi to reimburse them for unnecessary (in light of the conduct alleged herein) services, equipment, and expenses; and c) multi-million dollar payments made to a third party pursuant to the License Agreement, see License Agreement § 16.6. 99. Plaintiffs deny the allegations contained in Paragraph 99 of the Counterclaim and demand strict proof thereof. 100. IPH realleges the allegations in Paragraphs 1 through 88 as if fully set forth herein. 100. In response to Paragraph 100, Plaintiffs re-allege its responses to Paragraphs 1-99 as if fully set forth herein. 101. The License Agreement imposed two distinct confidentiality obligations as it relates to Leonardo and Rossi. See License Agreement § 16.4. 101. Plaintiffs state that the License Agreement and amendments thereto speak for themselves. Plaintiffs deny the allegations contained in Paragraph 101 to the extent that they are inconsistent with the terms of the License Agreement and demand strict proof thereof. 102. The License Agreement provides that “[w]hile this Agreement is in effect and after this Agreement terminates, each party hereto and its Affiliates shall keep confidential, and shall not disclose, the terms of this Agreement to any other Person without the prior consent of each other Party hereto,” except in two specific situations not relevant to Leonardo and Rossi’s disclosures referenced below. Id. 102. Plaintiffs state that the License Agreement and amendments thereto speak for themselves. Plaintiffs deny the allegations contained in Paragraph 102 to the extent that they are inconsistent with the terms of the License Agreement and demand strict proof thereof. 103. The License Agreement also provides that “[d]uring the term of this Agreement, each of Leonardo, Rossi, and AEG agrees to keep the E-Cat IP strictly confidential and not disclose any of the E-Cat IP to any other party,” except in specific situations not relevant to Leonardo and Rossi’s disclosures referenced below. Id. 103. Plaintiffs state that the License Agreement and amendments thereto speak for themselves. Plaintiffs deny the allegations contained in Paragraph 103 to the extent that they are inconsistent with the terms of the License Agreement and demand strict proof thereof. 104. Notwithstanding the clarity of the confidentiality provisions set forth above, Rossi, both individually and on behalf of Leonardo as its owner and sole operating officer, repeatedly violated the confidentiality provisions. 104. Plaintiffs deny the allegations contained in Paragraph 104 of the Counterclaim and demand strict proof thereof. a. Leonardo and Rossi disclosed that their agreement with Counter-Plaintiffs required a test of the Plant. b. Leonardo and Rossi disclosed that their agreement with Counter-Plaintiffs required a test to be conducted over 400 days. c. Leonardo and Rossi disclosed that their agreement with Counter-Plaintiffs required a test involving 350 days of operation of the E-Cat Plant. d. Leonardo and Rossi disclosed that their agreement with Counter-Plaintiffs required a guaranteed performance, or “guarantees of performance” test. 105. Plaintiffs admits that on a few occasions Rossi disclosed information relating to the Guaranteed Performance test, but denies that this was in violation of the License Agreement. Specifically, such disclosures were made with the knowledge and consent of the Defendants. In fact, Defendants hired APCO Worldwide, a public relations firm, to specifically provide “mantras” for Rossi to use in response to questions posed by him [sic] including questions relating to his relationship with Defendants. 106. Making matters worse, Leonardo and Rossi thereafter filed their Complaint, with the License Agreement attached to it, in a public court record without any attempt to seal the Agreement. Within an exceedingly short time, as Leonardo and Rossi knew would occur, the Agreement was replicated and made available to anyone in the world with access to the Internet. As a consequence of Leonardo and Rossi’s public disclosure of the License Agreement, the confidentiality provision barring disclosure of the License Agreement’s specific terms has been rendered a nullity. 106. Plaintiffs admit that they filed their Complaint in the above styled matter, but deny that such filing was in any way a violation of the terms of the License Agreement. Specifically, Defendants had already breached the terms of the License Agreement excusing any future performance by Rossi with respect to this provision. Moreover, such filing does not violate the plain terms of the License Agreement. was operated) to the scientists who prepared the Lugano Report, or authorized the scientists to obtain the samples. The scientists analyzed the E-Cat Fuel samples and published the results of their analysis. See Ex. 14.
b. Leonardo and Rossi, without any written waiver from IPH, disclosed specific information about the E-Cat Fuel to Norman Cook, a professor at Kansai University in Osaka, Japan. Rossi and Cook thereafter published a paper detailing new information about the E-Cat Fuel sample not disclosed in the Lugano Report. See Ex. 22.
c. Leonardo and Rossi, without any written waiver from IPH, have made public comments about the E-Cat Fuel sample on the Internet. 107. Plaintiffs deny the allegations contained in Paragraph 107 of the Counterclaim and demand strict proof thereof. 108. None of the E-Cat Fuel sample disclosures referenced in the prior Paragraph was protected by a non-disclosure agreement – as evidenced by the fact that the information obtained from the disclosures is publicly available. On information and belief, Leonardo and Rossi have made additional E-Cat Fuel sample disclosures without IPH’s consent and without the protection of a non-disclosure agreement, including as recently as May 2016. 108. Plaintiffs deny the allegations contained in paragraph 108 of the Counterclaim to the extent the claim infers that Plaintiffs were not permitted to disclose the fuel sample. Specifically, any disclosure of information was made with the express consent of Defendants as required under the License Agreement. Plaintiffs deny the remaining allegations contained in Paragraph 108 and demand strict proof thereof. 109. Leonardo and Rossi’s disclosure of the terms of the License Agreement harms IPH. For example, because the terms of the License Agreement have been made public, other entities (including current counter-parties to agreements) can use the License Agreement’s terms in negotiations over similar agreements with IPH or its affiliates. 109. Plaintiffs deny the allegations contained in Paragraph 109 of the Counterclaim and demand strict proof thereof. 110. Disclosure of the E-Cat IP also harmed IPH. For example, Counter-Plaintiffs have paid $11.5 million to Leonardo and millions more to a third party per the License Agreement for (among other things) control over any disclosure of the E-Cat IP. Clearly any value associated with the exclusive control over the disclosure of the E-Cat IP was diminished with any disclosure of the E-Cat IP by Leonardo and Rossi without IPH’s written waiver. Leonardo and Rossi disclosed that confidential information to third parties and, in some instances, made it available for large scale public consumption. To the extent that the E-Cat IP has commercial value, IPH’s ability to capture that value is substantially harmed by Leonardo and Rossi’s improper disclosures. 110. Plaintiffs deny the allegations contained in Paragraph 110 of the Counterclaim and demand strict proof thereof. 111. The License Agreement requires Leonardo and Rossi to assign the Licensed Patents, as defined in License Agreement § 16.1 and License Agreement Exhibit A, to Counter- Plaintiffs upon request: “Upon the request of the Company, Leonardo and Rossi shall assign to the Company the Licensed Patents with respect to the Territory[. ]” License Agreement § 10. 111. Plaintiffs state that the License Agreement and amendments thereto speak for themselves. Plaintiffs deny the allegations contained in Paragraph 111 to the extent that they are inconsistent with the terms of the License Agreement and demand strict proof thereof. 112. On February 17, 2016, IPH, through its counsel, requested that Leonardo and Rossi “assign to IPH the Licensed Patents (as defined by the [License] Agreement) with respect to the Territory (as also defined in the [License] Agreement).” IPH also provided Leonardo and Rossi an appropriate assignment form by which to assign the Licensed Patents. The request and assignment form are attached hereto as Exhibit 23. 112. Plaintiffs admit that IPH demanded that Plaintiffs “assign to IPH the Licensed Patents” and that IPH provided Plaintiffs the documents marked as Exhibit 23 to the Counterclaim. Plaintiffs deny that IPH provided Plaintiffs “an appropriate assignment form by which to assign the Licensed patents.” Plaintiffs affirmatively state that Defendants’ claim to possess the E-Cat IP is in conflict with Defendants’ allegations that the E-Cat technology either does not work, cannot be replicated, or is nothing but part of a larger scheme to defraud Defendants. 113. Leonardo and Rossi refused to assign the Licensed Patents to IPH in violation of the express and unambiguous terms of the License Agreement. 113. Plaintiffs deny the allegations contained in Paragraph 113 of the Counterclaim and demand strict proof thereof. 114. Leonardo and Rossi’s failure to assign the Licensed Patents caused IPH to suffer damages in that it is unable to secure any value that might be derived from having control over the Licensed Patents. 114. Plaintiffs deny the allegations contained in Paragraph 114 of the Counterclaim and demand strict proof thereof. (f) notify the Company in writing of any additions, deletions or changes in the status of such patent or patent application. License Agreement § 7.1. 115. Plaintiffs state that the License Agreement and amendments thereto speak for themselves. Plaintiffs deny the allegations contained in Paragraph 115 to the extent that they are inconsistent with the terms of the License Agreement and demand strict proof thereof. 116. Section 7.2 of the License Agreement states: “If Leonardo wishes to abandon any patent application or patent that is a Licensed Patent, it shall give the Company ninety (90) days prior written notice of the desired abandonment. Leonardo shall not abandon any such Licensed Patent except upon the prior written consent of the Company.” Id. at § 7.2. 116. Plaintiffs state that the License Agreement and amendments thereto speak for themselves. Plaintiffs deny the allegations contained in Paragraph 116 to the extent that they are inconsistent with the terms of the License Agreement and demand strict proof thereof. 117. After executing the License Agreement, Leonardo filed patent applications relating to the Licensed Patents without informing IPH. 117. Plaintiffs deny the allegations contained in Paragraph 117 of the Counterclaim and demand strict proof thereof. 118. Leonardo also failed to keep IPH informed of the progress of the patent applications relating to the Licensed Patents. Finally, Leonardo, without prior written consent from IPH, abandoned several patent applications. 118. Plaintiffs deny the allegations contained in Paragraph 118 of the Counterclaim and demand strict proof thereof. 119. Leonardo and Rossi charged to IPH fees and expenses associated with preparing, filing, and prosecuting patent applications relating to the Licensed Patents, which fees and expenses IPH paid. 119. Plaintiffs admit that certain fees were charged to Defendants which were associated with preparing, filing and prosecuting patent applications and that some fees were paid by Defendants. Plaintiffs lack sufficient knowledge to admit or deny whether such payment was made by IPH or another Defendant. 120. As a result of the foregoing, IPH has been harmed, not only as a result of the fees and expenses they paid, but also the diminution in value of the E-Cat IP for which they paid millions of dollars as a result of Leonardo’s improper handling of patent applications. 120. Plaintiffs deny the allegations contained in Paragraph 120 of the Counterclaim and demand strict proof thereof. 121. The License Agreement contains a clear and defined non-compete provision: For as long as the Company or any of its subsidiaries is engaged in any business related to the E-Cat Products and . . . Leonardo, Rossi or any Affiliate are performing services for the Company or such transferee (whether as an employee, consultant or otherwise and specifically including the period of services required by Section 13.1) and for an additional period of two (2) years after the last of Leonardo, Rossi or such Affiliate shall have ceased to provide such services, none of Leonardo, Rossi or any of their Affiliates will (except as an officer, director, stockholder, employee, agent or consultant of the Company or such subsidiary or the Company) directly or indirectly own, manage, operate, join, or have a financial interest in, control or participate in the ownership, management, operation or control of, or be employed or engaged as an employee, agent or consultant, or in any other individual or representative capacity whatsoever, or use or permit their names to be used in connection with, or be otherwise connected in any manner with any business or enterprise (a) engaged in the design, development, manufacture, distribution, lease, rental or sale of any E-Cat Products, or the provision of any services related thereto or (b) which is competitive with the E-Cat Products, unless Leonardo or such Affiliate shall have obtained the prior written consent of the Company or such subsidiary of the Company, as the case may be. License Agreement § 13.3. 121. Plaintiffs state that the License Agreement and amendments thereto speak for themselves. Plaintiffs deny the allegations contained in Paragraph 121 to the extent that they are inconsistent with the terms of the License Agreement and demand strict proof thereof. 122. Since at least the filing of their Complaint, and likely for months prior, Leonardo and Rossi have been open in broadcasting that they are engaged in designing and developing what are classified as “E-Cat Products” under the License Agreement. They have also been open that they are doing so in combination with a company or companies unaffiliated with IPH. See e.g., Ex. 24. Leonardo and Rossi have even claimed that they have recently sold at least three E- Cat Units. See e.g., Ex. 25. 122. Plaintiffs deny the allegations contained in Paragraph 122 as stated. Plaintiffs further state that Exhibits 24 and Exhibit 25 speak for themselves. Accordingly, Plaintiffs deny the allegations contained in Paragraph 122 of the Counterclaim to the extent they are inconsistent with Exhibits 24 and Exhibit 25 to the Counterclaim. 123. IPH has not provided written consent to such conduct. 123. Plaintiffs deny the allegations contained in Paragraph 123 of the Counterclaim and demand strict proof thereof. (footnote) 9. The License Agreement also includes a “Right of First Offer” provision that requires Leonardo and Rossi to provide IPH with notice of their intent to license the E-Cat IP outside of the Territory covered by the License Agreement, and to give IPH an opportunity to purchase such license. License Agreement § 13.2. Upon information and belief, Leonardo and Rossi have breached this provision as well by licensing or offering to license the E-Cat IP outside of the Territory without first offering such license to IPH. 124. Plaintiffs deny the allegations contained in Paragraph 124 of the Counterclaim and demand strict proof thereof. 125. Leonardo and Rossi’s violations of the License Agreement’s covenant not to compete have caused IPH to suffer harm, including the diminution in value of the E-Cat IP for which Counter-Plaintiffs paid millions of dollars. 125. Plaintiffs deny the allegations contained in Paragraph 125 of the Counterclaim and demand strict proof thereof. 126. Prior to Leonardo and Rossi entering the License Agreement, it was well known that Rossi had taxation issues with the Italian government, which even led to him facing criminal tax charges in Italy. 126. Plaintiffs admit that Rossi had “tax issues” in Italy more than twenty years ago. Plaintiffs deny that such issues were “well known” and Plaintiffs specifically state that Rossi was acquitted of any wrongdoing by the Italian courts. 127. As a result, the License Agreement has several carefully crafted provisions to ensure that Leonardo and Rossi would comply with their tax obligations as they relate to any payments from Counter-Plaintiffs. 127. Plaintiffs admit that the License Agreement has certain provisions relating to the payment of taxes. Plaintiffs deny the remaining allegations contained in Paragraph 127 of theCounterclaim. 128. First, the License Agreement (Section 12(j)) required a representation from both Leonardo and Rossi that each has filed all necessary “tax returns or reports” and “has paid all taxes required by any jurisdiction or subdivision or agency thereof” prior to entering the License Agreement. License Agreement § 12(j). 128. Plaintiffs state that the License Agreement and amendments thereto speak for themselves. Plaintiffs deny the allegations contained in Paragraph 128 to the extent that they are inconsistent with the terms of the License Agreement and demand strict proof thereof. 129. Second, the License Agreement (Section 13.5) required each party to file all necessary documentation and returns as to any tax applicable to its or his “respective revenues derived . . . in respect of the E-Cat IP.” Id. § 13.5. 129. Plaintiffs state that the License Agreement and amendments thereto speak for themselves. Plaintiffs deny the allegations contained in Paragraph 129 to the extent that they are inconsistent with the terms of the License Agreement and demand strict proof thereof. 130. Third, the License Agreement (Section 12(a)) required Leonardo and Rossi to keep the E-Cat IP “free and clear of any Liens.” Id. § 12(a); see also id. § 12(e). 130. Plaintiffs state that the License Agreement and amendments thereto speak for themselves. Plaintiffs deny the allegations contained in Paragraph 130 to the extent that they are inconsistent with the terms of the License Agreement and demand strict proof thereof. 131. Fourth, IPH had Leonardo and Rossi provide it with a signed certificate certifying that all of their representations and warranties from the License Agreement, which included their representations as to compliance with their tax obligations, were true and correct as of the date of the certification (April 29, 2013) and would continue to be true after Leonardo was paid $10 million under the License Agreement. See Ex. 8. 131. Plaintiffs deny the allegations contained in Paragraph 131 of the Counterclaim and demand strict proof thereof. Plaintiffs further state that the Certificate attached to the Counterclaim as Exhibit “8” speaks for itself. Plaintiffs deny the remainder of Paragraph 131 to the extent it is inconsistent with the terms of the Certificate attached to the Counterclaim as Exhibit 8. 132. Notwithstanding the foregoing, on information and belief, Leonardo and Rossi have not paid their federal taxes on payments made to them from Counter-Plaintiffs, and have not filed all tax returns or reports relating to payments made to them from Counter-Plaintiffs. 132. Plaintiffs deny the allegations contained in Paragraph 132 of the Counterclaim and demand strict proof thereof. 133. Leonardo and Rossi’s failure to report and/or pay taxes on such payments is a prior breach of the License Agreement that serves as a defense to Plaintiffs’ breach of contract claims against Industrial Heat and IPH. Based on Leonardo and Rossi’s representation that no tax lien has been imposed affecting Industrial Heat and/or IPH’s assets or rights under the License Agreement, Industrial Heat and IPH do not assert this breach as a basis to recover damages from Leonardo and Rossi presently, but reserve the right to assert this claim in the event a federal tax lien is issued affecting Industrial Heat and/or IPH’s assets or rights under the License Agreement. 133. Plaintiffs deny the allegations contained in Paragraph 133 of the Counterclaim and demand strict proof thereof. 134. Industrial Heat realleges the allegations in Paragraphs 1 through 88 as if fully set forth herein. 134. In response to Paragraph 134, Plaintiffs re-allege its responses to Paragraphs 1-133 as if fully set forth herein. 135. Rossi, Leonardo, JMP, and Johnson falsely represented to Industrial Heat that JMP was a manufacturing company with a real commercial use for the steam power generated by the Plant. 135. Plaintiffs deny the allegations contained in Paragraph 135 of the Counterclaim and demand strict proof thereof. 136. In reality, JMP was not a manufacturing company, had no commercial use for the steam power generated by the Plant, and was created solely as a ruse to induce Industrial Heat to ship the Plant to Florida. 136. Plaintiffs deny the allegations contained in Paragraph 136 of the Counterclaim and demand strict proof thereof. 139. Plaintiffs deny the allegations contained in Paragraph 139 of the Counterclaim and demand strict proof thereof. 137. Rossi, Leonardo, JMP, and Johnson made such false representations to induce Industrial Heat to enter into the Term Sheet so that Leonardo and Rossi could operate the Plant without Industrial Heat’s direct supervision or oversight, thereby allowing them to manipulate the operation of the Plant, any measurement of the operation of the Plant, and any purported “Guaranteed Performance” testing of the Plant. 137. Plaintiffs deny the allegations contained in Paragraph 137 of the Counterclaim and demand strict proof thereof. 138. Industrial Heat justifiably relied on such false representations in entering into the Term Sheet. Industrial Heat would not have agreed to the Term Sheet but for such false representations. 138. Plaintiffs deny the allegations contained in Paragraph 138 of the Counterclaim and demand strict proof thereof. 139. As a result of Rossi, Leonardo, JMP, and Johnson’s fraudulent inducement, Industrial Heat has suffered and continues to suffer damages. Among the damages are the following: the cost of transporting the Plant to Florida; the cost of operating the Plant in Florida; the cost of engaging and paying two independent contractors, one of whom was Fabiani; and a host of additional expenses charged to Industrial Heat in connection with the operation and maintenance of the Plant in Florida. 140. Counter-Plaintiffs reallege the allegations in Paragraphs 1 through 135 as if fully set forth herein. 140. In response to Paragraph 140, Plaintiffs re-allege its responses to Paragraphs 1-139 [sic] as if fully set forth herein. 141. As described in greater detail above, Rossi, Leonardo, Johnson, JMP, Penon, Fabiani, USQL, and Bass (the “FDUTPA Defendants”) were all engaged in a common scheme against Counter-Plaintiffs. 141. Plaintiffs deny the allegations contained in Paragraph 141 of the Counterclaim and demand strict proof thereof. 142. The first part of the scheme was to manipulate Counter-Plaintiffs into allowing the Plant to be sent from the Industrial Heat facility in North Carolina – where any work on, operation of, or testing of the Plant could be supervised and overseen by Counter-Plaintiffs – to Florida, where Leonardo, Rossi, USQL, Fabiani, and Penon could operate the Plant and purportedly conduct measurements of the Plant’s operations away from the oversight and control of Counter-Plaintiffs. 142. Plaintiffs deny the allegations contained in Paragraph 142 of the Counterclaim and demand strict proof thereof. 143. The second part of the scheme was to manipulate the operation of the Plant and the measurements of the Plant’s operations to create the false and deceptive appearance and impression that the Plant was performing at astronomical levels, with COP measurements not only well in excess of anything achieved by any third party testing of the E-Cat technology, but in fact many multiples higher than anything achieved by any third party testing. For example, notwithstanding flaws in their testing methodology that would have caused them to overstate their conclusions of the COP they were measuring from an E-Cat reactor, the Lugano scientists concluded that the E-Cat reactors they measured were producing a COP of 2.6, 2.9, 3.2, 3.6 or 5.6. According to the manipulated and fabricated testing and measurements of the FDUTPA Defendants, they – through Leonardo, Rossi, and Penon – claimed that they were achieving COPs more than 10 times greater than the Lugano scientists, and in fact as high as 40+ times greater than the Lugano scientists. 143. Plaintiffs deny the allegations contained in Paragraph 143 of the Counterclaim and demand strict proof thereof. 144. The final part of the scheme, of course, was for Leonardo and Rossi, based on the false and deceptive operations of the Plant in Florida, to claim to Counter-Plaintiffs that they were required to pay Leonardo and Rossi $89 million and, when Counter-Plaintiffs rightfully refused, to institute litigation against Counter-Plaintiffs. 144. Plaintiffs deny the allegations contained in Paragraph 144 of the Counterclaim and demand strict proof thereof. 145. Another goal of the scheme was to obtain various payments from Counter- Plaintiffs for work that one or more of the FDUTPA Defendants was performing not to benefit Counter-Plaintiffs, but in fact with the goal of harming Counter-Plaintiffs. Among these payments were service payments to USQL, Fabiani, and Penon; expense reimbursements to Leonardo, Rossi, USQL, Fabiani, and Penon (including for travel, apartment rentals, visa-related costs, repair work to the Plant, patent attorneys, and patent application fees); and payments for equipment (or the transportation of equipment) to be used – or purportedly to be used – by the FDUTPA Defendants. 145. Plaintiffs deny the allegations contained in Paragraph 145 of the Counterclaim and demand strict proof thereof. a. Deceiving Counter-Plaintiffs about JMP, the operations of JMP, the supposed role of Bass, and the reasons for JMP wanting to use the steam power that could be generated by the Plant. b. Deceiving Counter-Plaintiffs as to the reasons for wanting to move the Plant from North Carolina to Florida. c. Manipulating the operation of the Plant and the measurements of the Plant’s operations to create the false impression and appearance that it was producing a COP far in excess of the COP it was in fact achieving. d. Providing false information to Counter-Plaintiffs as to the operation of the Plant and the measurements of the Plant’s operations. e. Refusing to provide other information properly requested by Counter- Plaintiffs, and to which Counter-Plaintiffs were entitled pursuant to the License Agreement, the Term Sheet, the USQL Agreement, and/or the nature of the purportedly (but in fact, not) independent work being done by Penon. f. Preventing or blocking Counter-Plaintiffs from obtaining truthful information about the Plant’s operations, the measurements of those operations, the role of JMP, the use by JMP of steam provided by the Plant, the role of Penon, or the bases for expenses or costs charged to Counter-Plaintiffs. g. Charging Counter-Plaintiffs for services, expenses, and equipment that were purportedly being used either for the benefit of, and to further the goals of, Counter-Plaintiffs when in fact no such services, expenses, or equipment were being used for Counter-Plaintiffs’ benefit. 146. Plaintiffs deny the allegations contained in Paragraph 146 of the Counterclaim and demand strict proof thereof. 147. The acts and practices alleged above, including in the prior paragraph, were unconscionable, unfair, and deceptive. As such, they have been declared unlawful pursuant to Section 501.204 of the Florida Deceptive and Unfair Trade Practices Act (“FDUTPA”). 147. Plaintiffs deny the allegations contained in Paragraph 147 of the Counterclaim and demand strict proof thereof. 148. As a result of the foregoing acts and practices declared unlawful under FDUTPA, Counter-Plaintiffs have suffered and continue to suffer actual damages, as described above. 148. Plaintiffs deny the allegations contained in Paragraph 148 of the Counterclaim and demand strict proof thereof. 149. Industrial Heat realleges the allegations in Paragraphs 1 through 88 as if fully set forth herein. 149. In light of the fact that Plaintiffs are not a parties to Count V of the Counterclaim, no response to this allegation by Plaintiff is required. To the extent any response by Plaintiffs is required, Plaintiffs deny this allegation. 150. Industrial Heat retained USQL and Fabiani to “provide services related to the manufacture and development” of products relating to the E-Cat IP. See USQL Agreement, Page 1. They were required to act in a manner in, and not opposed to, the best interests of Industrial Heat. See id. § 3. 150. In light of the fact that Plaintiffs are not a parties to Count V of the Counterclaim, no response to this allegation by Plaintiff is required. To the extent any response by Plaintiffs is required, Plaintiffs deny this allegation. All Confidential Information, records, files, memoranda, reports, drawings, plans, designs, specifications, tests and results, recordings, documents and the like (together with all copies thereof), including any of the foregoing that are electronically maintained, relating to the business of Industrial Heat or the engagement of USQL [and Fabiani] pursuant to this Agreement that USQL [and Fabiani] shall use or prepare or come in contact with in the course of, or as a result of, the engagement of USQL [and Fabiani] under this Agreement shall remain the sole property of Industrial Heat . . . .
151. In light of the fact that Plaintiffs are not a parties to Count V of the Counterclaim, no response to this allegation by Plaintiff is required. To the extent any response by Plaintiffs is required, Plaintiffs deny this allegation. USQL [and Fabiani] further agree that . . . [they] will promptly disclose to Industrial Heat any and all improvements, inventions, developments, discoveries, innovations, systems, techniques, processes, formulas, programs and other things that may be of assistance to Industrial Heat or its affiliates, whether patentable or unpatentable, that (i) relate to the actual or demonstrably anticipated research or development by Industrial Heat or any of its affiliates, or (ii) result from any work performed by USQL [and Fabiani] for or at the request of Industrial Heat, or (iii) are developed on Industrial Heat’s time or using the equipment, supplies or facilities or any Confidential Information or trade secret information of Industrial Heat, or any of its affiliates; and that are made or conceived by USQL [and Fabiani], alone or with others, while engaged by Industrial Heat (collectively referred to herein as the “New Developments”). USQL [and Fabiani] agree that all New Developments shall be and remain the sole and exclusive property of Industrial Heat and that it shall upon the request of Industrial Heat, and without further compensation, but at the cost and expense of Industrial Heat, do all things reasonably necessary to [e]nsure Industrial Heat’s or its affiliate’s ownership of such New Developments. 152. In light of the fact that Plaintiffs are not a parties to Count V of the Counterclaim, no response to this allegation by Plaintiff is required. To the extent any response by Plaintiffs is required, Plaintiffs deny this allegation. 153. USQL and Fabiani breached the USQL Agreement by failing to provide services to Industrial Heat relating to the manufacture and development of the Plant and the E-Cat IP. More specifically, USQL and Fabiani disregarded their contractual obligations to Industrial Heat in order to assist Leonardo and Rossi in their deceptive operations in Florida. Indeed, instead of working in “the best interests of Industrial Heat,” as required by USQL Agreement § 3, Fabiani and USQL were – as Fabiani publicly admitted – working “under Rossi’s orders,” including assisting Rossi in actions directly against Industrial Heat’s interests as alleged above. 153. In light of the fact that Plaintiffs are not a parties to Count V of the Counterclaim, no response to this allegation by Plaintiff is required. To the extent any response by Plaintiffs is required, Plaintiffs deny this allegation. 154. USQL and Fabiani also breached the USQL Agreement by failing to provide Industrial Heat with information relating to the scheme to manipulate the operation and testing of the Plant. USQL and Fabiani had an affirmative obligation to inform Industrial Heat of the scheme to manipulate the Plant’s operations and the testing. Such information would constitute a “New Development” that USQL and Fabiani were required to disclose to Industrial Heat pursuant to the USQL Agreement. USQL and Fabiani also refused to provide other information to Industrial Heat, as alleged above. USQL and Fabiani intentionally withheld information from Industrial Heat relating to the scheme and, therefore, breached the USQL Agreement. 154. In light of the fact that Plaintiffs are not a parties to Count V of the Counterclaim, no response to this allegation by Plaintiff is required. To the extent any response by Plaintiffs is required, Plaintiffs deny this allegation. 155. USQL and Fabiani further breached the USQL Agreement by failing to provide Industrial Heat with information, including reports and data, relating to the operation of the Plant in Doral, Florida. Industrial Heat made several demands for such information and USQL and Fabiani have repeatedly refused to provide Industrial Heat with the reports and data. See, e.g., Ex. 21. 155. In light of the fact that Plaintiffs are not a parties to Count V of the Counterclaim, no response to this allegation by Plaintiff is required. To the extent any response by Plaintiffs is required, Plaintiffs deny this allegation. 156. Industrial Heat and IPH have suffered harm as a result of USQL and Fabiani’s breaches of the USQL agreement including USQL and Fabiani’s failure to further the best interest of Industrial Heat, failure to provide Industrial Heat with information relating to the scheme pled herein, and failure to provide Industrial Heat with other information requested by Industrial Heat or that they were required to provide Industrial Heat. These breaches have deprived Industrial Heat of the benefit of its bargain with USQL and Fabiani, led to Industrial Heat paying USQL and Fabiani for services not rendered, deprived Industrial Heat of property that is its property per the USQL Agreement, and prevented Industrial Heat from learning of the deceptive scheme as alleged above. 156. In light of the fact that Plaintiffs are not a parties to Count V of the Counterclaim, no response to this allegation by Plaintiff is required. To the extent any response by Plaintiffs is required, Plaintiffs deny this allegation. Plaintiffs deny that Defendants are entitled to any relief on the Counterclaim. Plaintiffs request this Honorable Court award Plaintiffs their reasonable attorneys’ fees and costs incurred in the defense of the Counterclaim. Great effort, Abd. Thank you. Thanks. If I were a judge or an attorney working on this case, I’d want a document like this, and I’m thinking of other neutral organizing documents. The docket will drive anyone crazy if they are not familiar with the case…. Maybe this is why attorneys are so crazy. Look what they have to deal with!